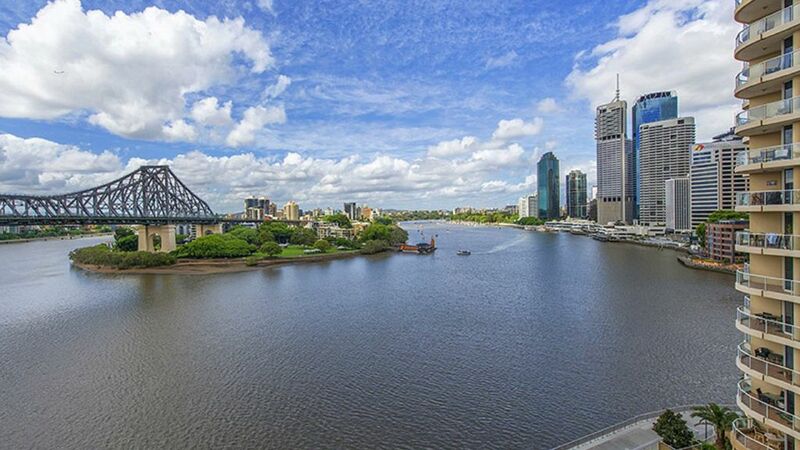 Enjoy Brisbane's best location & breathtaking uninterrupted views of the Story Bridge, Brisbane River and the city in this Level 8 apartment with direct access to the river & is a short walk to CBD, Howard Smith Wharfs, Eagle Street Pier, Queen Street, business centres and Fortitude Valley. Spacious Two Bedroom Apartments includes two bedrooms sleeps 5 with Queen bed + 1 x single bed + bunk bed sleeps 5, air-conditioning, fully equipped kitchen, dishwasher, laundry, large screen TV, Wi-Fi, carpark,private balcony with breathtaking views. Great location, clean and functional. Fantastic location, apartment very clean and very well set up with all you need. But linens, bed, pillows need replacing and the decor needed some very minor clean up (missing light fixture cover in bathroom, chipped floor, stained carpet). Overall really great location and great value for money, impeccably clean and equipped, but a little upgrade on bed, pillows and linens would be great. Check in and out was fine. Owner reliable and had prepared and planned for our visit, building was clean, quiet, and easy to access. Excellent base is staying in Brisbane. We spent a week in Brisbane & stayed in this apartment on level 8 at 82 Boundary Street which is just adjacent to the Storey Bridge on the city side. The main purpose for our trip was to catch up with two friends who lived on the river at New Farm which is just a few minutes walk (albeit up a killer of a hill in Ivory Street). This was a minor thing though as we walked most everywhere. The apartment is excellent wit breathtaking views both during the day & at night time. The building is 38 levels but the best locations are on the lower floors. We plan a longer stay in Brisbane again next year & hope that this apartment will be available at that time.